WyWaste captured first place in the inaugural “Knoxville City Hackathon” held over the weekend in Downtown Knoxville. It was one of three of the six finalist teams that focused on an aspect of managing solid waste. In the case of WyWaste, it’s concept was to equip garbage trucks with cameras that could visually capture the reason that a citizen’s trash was not picked-up on schedule. Second place went to Sponsor by Lyft which was a way to address transportation needs of the homeless and others in need. Third place was captured Curb the Violations, another solid waste tool. In this case, the idea was to send post cards to repeat violators of solid waste regulations. Potify won the “Fan Favorite” for its idea on sharing information about potholes with the Department of Public Works. 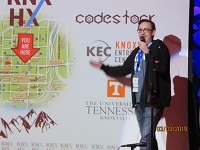 Organized by the KnoxDevs group and spotlighted in this recent teknovation.biz article, the 28-hour marathon started Saturday morning with a focus on apps to accelerate the City of Knoxville’s open data initiative. A list of focus areas was released about a week ago (KnxHx_Open_Data_Challenges). About 100 people in 20 teams participated in the Hackathon. Their solutions are or will soon be available at www.knxhx.devpist.com. Here’s Cody Lambert, one of the organizers, kicking-off the pitch competition.